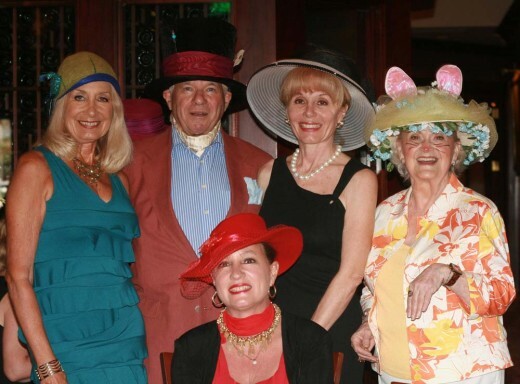 Members of The Opera Society recently celebrated our annual Mad Hatter’s Tea organized by Chairman Gloria Kline at the elegant Capital Grille. Guests were greeted by a beautiful display of evening handbags, jewelry and hats for sale as they sipped champagne. Evening bags and jewelry were from Stella and Dot, shown by Lynsie Xerri. Noorina Mirza displayed the beautiful hats. As the lovely tea progressed to scones with cream and French macaroons, Dr. Gloria Kline introduced the stage actor, Peter Hawkins, our Mad Hatter, to begin a reading of the famous poem, Jabberwocky, from Alice in Wonderland. Our very special hat judges, Stacy Ostrau, the Sun Sentinel Society Scene Publisher, and Robert Allen of Robert Allen Salons were faced with the difficult task of choosing the winners in the various categories of the hat competition. Liannette Marquez won in the Vintage category with her lovely Dior ensemble. Carol Call won in the Romantic/ Seductive category and Mary Harrison won with her delightful “Fascinator”. Enjoy the lovely pictures of the day! !